Crowdsourcing has long been a popular tool for the advertising industry, but it also makes a lot of sense as an investment tool. After all, the market is completely driven by the supply and demand, so it can be valuable to see what names are trending among the crowd. While some fund managers are already trying to leverage social media resources like Twitter to find algorithmic trading opportunities, for most investors, crowdsourcing works best as a starting point for investors who want a starting point in their analysis. Shares of $14 billion communications stock CenturyLink Inc. (CTL - Get Report) are dropping on big volume this afternoon, off more than 11% as of this writing, following news that the firm is buying Level 3 Communications (LVLT for $34 billion in cash and stock. The deal represents just over a 40% premium to where shares of Level 3 were sitting before buyout rumors emerged last week. The deal would create an internet connectivity powerhouse that gives the firms the ability to compete better with telco giants. From a technical standpoint, even though shares of CenturyLink are down this afternoon, this stock's uptrend is still intact. CenturyLink has been in an uptrend since the start of the summer, making a series of slightly higher lows that stretch back to May. 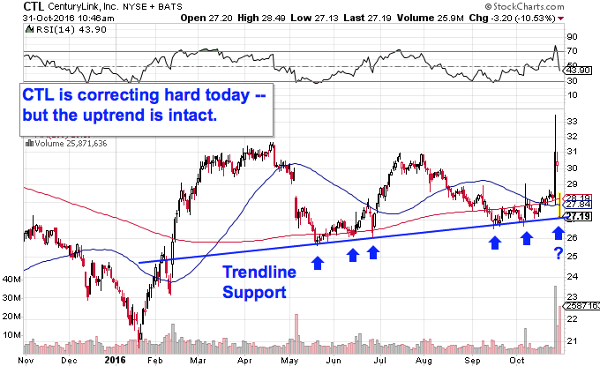 Today, shares are finding support at that trendline. From here, a bounce higher looks like a low-risk buying opportunity in CTL. The other side of the CenturyLink trade is Level 3 Communications. Level 3 is up just under 5% following confirmation of the buyout news -- shares rocketed higher last week when the rumors first hit that LVLT was a buyout candidate. Level 3 shareholders will get $26.50 per share in cash, plus 1.4286 shares of CenturyLink for every share of LVLT they own - that works out to a deal price of $65.14 per share at current levels. That means Level 3 is currently trading at a 15.75% discount to its offer price here, signaling that market participants are weighing the risks that the combination won't pass regulatory muster. 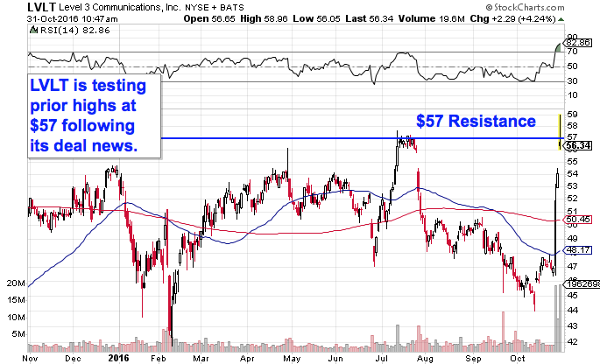 In the meantime, Level 3 Communications is finding a near-term price ceiling at $57 resistance, a prior high that got set back in July. If the merger deal passes regulatory hurdles, LVLT could translate into a tidy profit for investors willing to take the headline risk right now. Shares of $3 billion healthcare staffing firm TeamHealth Holdings (TMH are rallying 16% on big volume this afternoon, gapping higher on news the firm had agreed to be bought by former owner Blackstone Group LP in a deal that will pay TMH shareholders $42.50 per share. Despite the upside move in shares today, the offer price isn't exactly a win for TeamHealth shareholders. 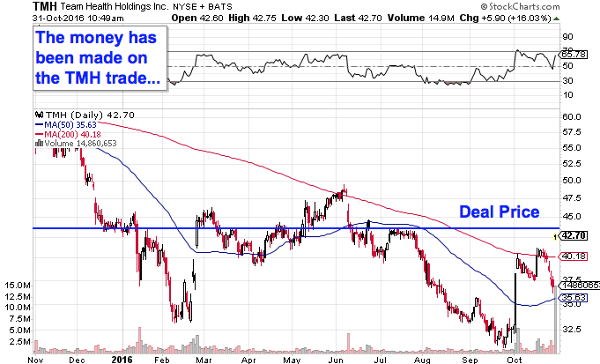 Shares were trading above the offer price as recently as June, and TMH management rebuffed an offer from AmSurg Corp. (AMSG that valued TeamHealth at almost $70 a share just a year ago. Shares moved almost up to their offer price at the open Monday, which means that the money has already been made on the TMH trade. Investors who missed the move should look elsewhere for gains this fall. Advanced Micro Devices (AMD - Get Report) is another merger-related play. Shares of the chipmaker are up almost 2% on heavy volume following reports the firm could be in the final stages of negotiating a buyout deal from Oracle (ORCL - Get Report) . If true, the buyout would cap off a stellar year for AMD, where shares have managed to rally 155% higher. Technically speaking, AMD is still in an uptrend this fall, which means that it's a "buy the dips stock" as shares ride their support line to higher levels in October. For buyers who deicde to jump onto the AMD trend here, it makes sense to park a protective stop on the other side of AMD's most recent swing low down at $6.50. The VanEck Vectors Gold Miners ETF (GDX - Get Report) is seeing big volume once again Monday as investors turn to this gold mining fund as a ramped-up way to get exposure to swings in the price of the precious metal. For most of 2016, that's been a good thing, as GDX has embarked upon a substantial rally. 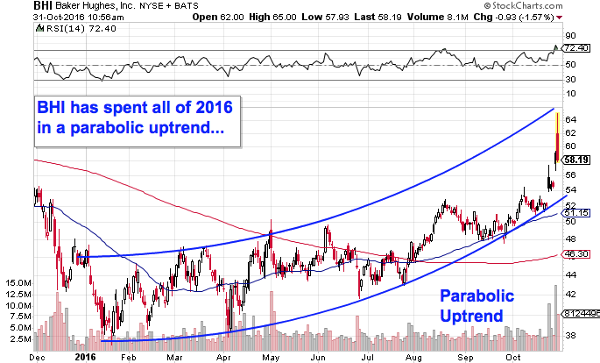 But that changed in August, when shares rolled over and violated the uptrend that's been in place for most of the year. 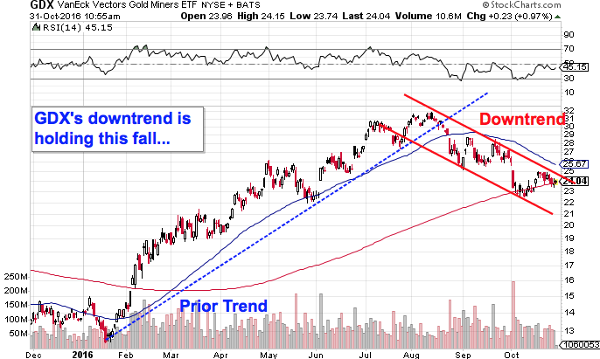 Now, with a downtrend that's holding strong this fall, GDX is a name you don't want to own at this point - wait for shares to break free of that downtrend before thinking about taking a position in this ETF. Shares of oilfield services giant Baker Hughes Inc. (BHI are correcting on big volume following news that the firm plans on combining with the oil and gas business of industrial behemoth General Electric (GE - Get Report) to create a $32 billion energy company. GE will own 62.5% of the new publicly-traded company, with Baker Hughes shareholders controlling the rest. Despite major black clouds surrounding BHI's failed merger with Halliburton (HAL - Get Report) , this stock has actually been an attractive name to own in 2016, spending much of the year in a parabolic uptrend that's rocketed shares 25% higher for the year to date. 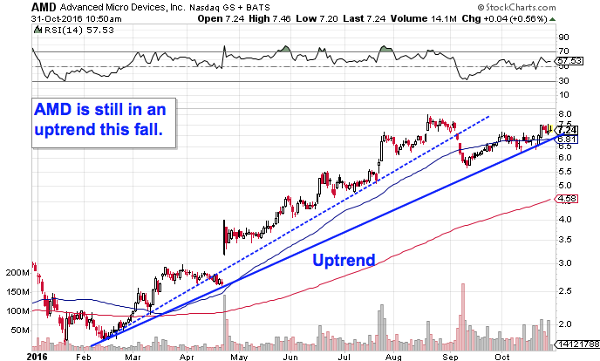 That uptrend remains intact despite the correction. For investors willing to take the headline risk surrounding today's deal announcement, there could be more upside left in Baker Hughes this year.